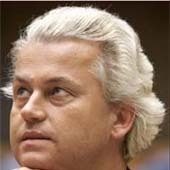 Geert Wilders is a politician from the political party PVV, with his comments on society and Islam he has caused alot of commotion in The Netherlands. Wilders wrote some books too, like Fitna in 2009 and Ground Zero Moskee in 2010. His latest book is "Marked for Death, Islam's war against the West". Although it is officially published on May 1, there were allready some copies available at a Washington Bookstore. It also can be Pre ordered online. In this book he calls out for the Americans to resist the Islam. It is almost a Summary how Wilders could grown into what he is now, with all his political ideas. Although the times he goes personal , are scares. Just one time he became personal when he writes about the dead of his father in 2005. He wrote that he could not stay in the house where his father was dying because he had to go to the hiding place. On his way to the shelter he cried alot, and his Body guards did not know how to handle this situation. "They are Good guys, but still strangers"
The book is focussed on the American market. He has no good words for Israel, and he makes a enormous snere to President Obama. Wilders wrote how his life drastically changed after the murder on Theo Van Gogh. Two days after the murder he was placed under protection of heavy armed soldiers with bullet proof clothes on. He and his wife were brought to an icecold room, which contained only two chairs and two beds. About his shelter/hiding place Wilders wrote that it is a bullitproof environment, and that there is a "Panicroom"in case some of the folllowers of the "religion of peace" are able to pass his guards. 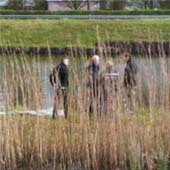 In Schijndel, human remains were found at the Zuid-Willems Vaart. Fishermen found it this morning. The remains look like a part of a spine. The police is investigating the human bodypart. Earlier on Thursday they found human parts too, of which a part of a leg. The Norwegian mass murderer Anders Behring Breivik said today in court that he is not guilty to terroristic activities, but acted out of self defence. He admitted detonating the bomb in Oslo and shooting young social demorcrates on the island Utoya in July 2011, but he does not see this as a crime. The 33 year old Brevik said his actions were gruesome but nescessary. He said he wanted to act against the state traitors who allowed multiculturalism and a "Muslim invasion in Europe. Breivic said that he saved Norway for Islamization. There was alot of commotion at the beginning of the courtsession, when Breivic entered and was released of his hand cuffs, he made a salute with his fist on his chest and then with a forward arm stretched. -Prosecutors said today that they found no evidence of the existence of a Templar network. Breivik previously claimed a to be a freedom fighter in an extreme right-wing militant group based on a western Christian Templar order who fought in the Crusades against Islam . But the police officers who investigated the allegation, found no traces of the so-called movement and think Breivic operated on his own. This courtcase is expected to last 2.5 months and is already the longest and most expensive ever in Norwegian court. On a Sunday , the 29th of Februari 2004, a 52 year old Taxi driver was nurdered in Rotterdam. The investigation into his death had no results. But the cold case team of Rotterdam found new information and re opened this case. 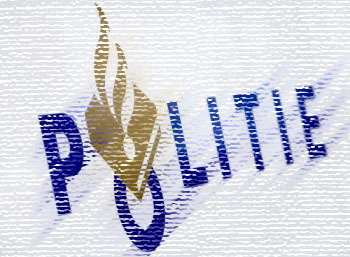 On Monday, April 16, the police arrested a 26 year old man out of Rotterdam in the Penitentiary in Middelburg. He is suspected of murder / manslaughter of the taxi driver Gerard Denz. Last week on April 10, the police arrested a 23 year old man who was envolved in this case out of 2004. Push that record button! And go to bed. Netherlands looses first game in European championship against Denmark.